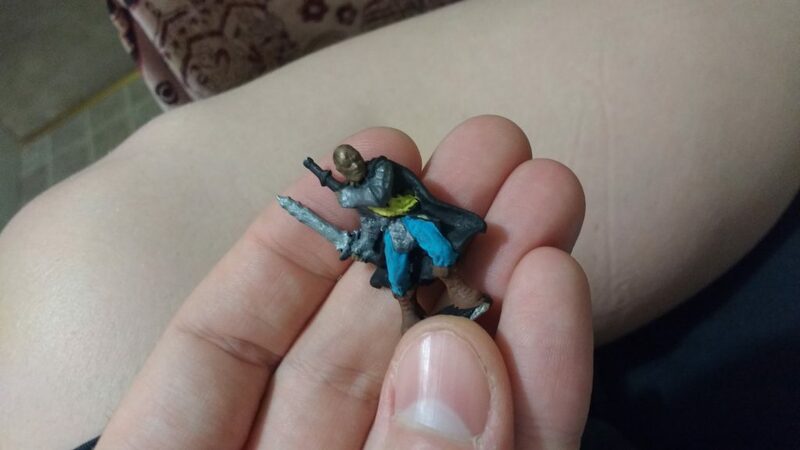 I have been using the Ridley Darkedge miniature from Reaper’s Dark Heaven Legends line for a nonplayer character of some significance in my current Broken Covenant campaign and I got impatient to paint it for an upcoming scene. It’s a metal miniature so it had to be primed first but the spray on primer again came out clumpy and uneven. This is when I started researching alternatives to spray on primer and discovered that Gesso could be used for miniatures. I followed two guides primarily; Priming With Acrylic Gesso from Dakka Dakka and Priming Miniatures: Gesso from A League of Ordinary Gamers. As you can see the results left a lot to be desired. It was true that Gesso was like magic when it worked, like with the Khurasan Stikks that I did at the same time, it was impressive to watch globs of the stuff tighten up around details and provide a firm priming coat. Unfortunately, it wasn’t as magical for Ridley Darkedge as it was for the groups of Stikks that I primed at the same time. Granted I probably should have done a better job of removing the coat of spray on primer. I only felt more unhappy with the loss of detail as I tried to paint this one so I decided to set it aside for now until I can strip off the paint to try again – it sounds like Simple Green is the way to go.